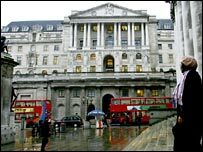 The Bank of England has warned that risks to the financial system have increased as a result of globalisation. In a major speech, the Bank's executive director for financial stability, Nigel Jenkinson, said that major financial institutions were taking more risks. He warned that the "vulnerability of the financial system as a whole to a sharp change in conditions has risen". The Bank is calling for greater cross-border co-operation by regulators to prevent future financial meltdowns. In a speech in Switzerland, Mr Jenkinson warned that the explosive growth of global financial markets meant that, while risks were spread more widely, the danger that a financial crisis might spread quickly across borders had increased. He pointed out that although the financial system might be more resilient to "small and medium-size" shocks, there "may be a greater vulnerability to less frequent but potentially larger financial crises". Mr Jenkinson said that banking regulators were actively looking at how to improve cross-border settlement systems and the legal status of banks' claims on each other. He also asked banks to evaluate closely how risky their investments might be under conditions of financial stress. Mr Jenkinson's comments follow remarks by Mervyn King, the governor of the Bank of England, on Thursday, where he expressed concern about the banks' involvement in "highly leveraged lending" such as investing in hedge funds. The worries centre around the growing practice of banks buying up a package of credit risks, such as mortgage debt, on the grounds that they are spreading the risk. The credit derivatives market has grown 20-fold in the past five years, from $1 trillion in 2001 to $20 trillion in 2006, and leveraged loans have increased three-fold in the same period. "Benign economic and financial conditions have kept credit losses at low levels," Mr Jenkinson said. "But this has encouraged an increase in risk-taking and a 'search for yield' which has lowered the compensation for bearing credit and market risk to very low levels." The fear is that a sudden collapse in the value of these debts could trigger a run on the banks worldwide, and that no single financial regulator in any one country could cope with the problems that might arise. In the last big financial crisis in 1998, when US hedge fund LTCM collapsed, the main US banks were forced by the Federal Reserve to spend huge sums to keep the firm afloat, while the Fed made an emergency cut in interest rates.